In the Scope of Eternity. . . This simple question can create a lens or filter through which we can assign value and importance to our experiences. It helps us know if something is worth getting upset about or not. If it’s not going to matter two weeks from now, much less in eternity, let it go. Many of our stressors would be less stressful if we would just put them in perspective. It’s helpful to ask myself this question when I’m experiencing nighttime sleeplessness, or physical pain, or financial stress. And it’s also helpful to ask myself this question when I’m concerned about my loved ones; when the answer is, “In the scope of eternity, this is REALLY important,” it motivates me to pray. Hard. And long. What are you wrestling with? 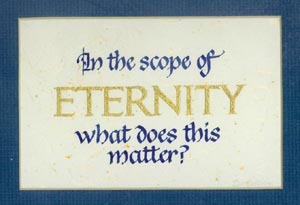 In the scope of eternity, what does it matter, really? Does this question help?